Adds several hidden treasure chests to the cities of Skyrim. Each are filled with useful items like (semi-unique) weapons, potions, scrolls, gold and much more. 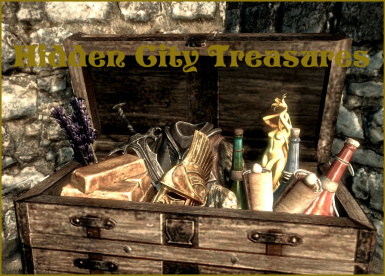 This mod adds 32 hidden treasure chests to the cities of Skyrim. The chests are placed in hidden or hard to reach places. You won't find any of them if you just walk around the city, you'll have to look for hidden places or places that are not reachable by normal means. Inside the chests you'll find useful and even some unique items. (Unique means unique names, stats, enchantments.) Unlike the normal leveled treasure chests in Skyrim the loot you'll find in these chests is hand-picked. That means the items are most valuable to low- and midlevel players, but even players with a high level will find use in most of them. This mod should be compatible with most mods. Mods that change the cities or some of the buildings could be a problem though. Put the file above those files in the load order so they can overwrite my mod if necessary. I know there are several mods like this available on the nexus. It would be pure coincidence If the other modders added chests to the same locations like I did. I'm pretty sure they didn't so install them too for even more treasures! Just drop the file into the data folder and then activate it in the Skyrim-launcher or NMM. I also added a readme file with the number of chests per city so you know when you can stop searching. I added a chest to each of the Jarl Palaces in Whiterun, Solitude, Windhelm, RIften and Markarth. I also fixed some items, changed some values and the descriptions of the items and their enchantments are now more informative.